Considering outsourcing? Thinking of finding a freelancer to do some of your web development work, or data entry or administrative work? You are on the right track. You can save a bunch and get a lot of work done if you find a good freelancer or a team. 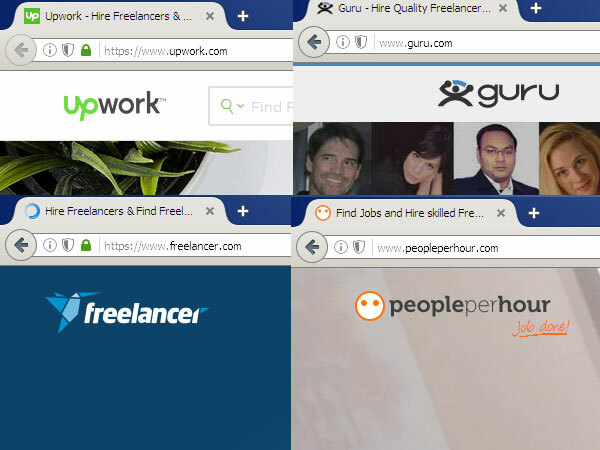 Freelancer – Popular and getting bigger by the day. They bought out several smaller competitors and have become quite big. Large pool of freelancers. The interfaces are too graphic intensive and that makes it slower than it should be. It seems the designers are not that great at UI design and mistake big graphics to be user friendly. The encouraging part is that they seem to be headed in the right direction. Let’s hope they can incorporate a work room like the old Elance used to have, that is, the client hires a freelancing team and then the team assigns resources to the work room. That is a key feature favored by clients whose jobs require multiple resources. Instead of hiring 4 separate people, a consolidated work room will allow a client to hire one team and then let the team manage by assigning multiple resources and aggregating their hours. Chances of finding a good freelancer – High. Chances of finding a good team – High. People Per Hour – Small – more popular in UK but gets a decent clientele from USA also. Simple interface. They don’t waste your time with clunky graphics. Chances of finding a good freelancer – Fair. Chances of finding a good team – Fair. Upwork: This is the big behemoth resulting from the merger of Odesk and Elance. Elance had the better framework and UI. Unfortunately the merged company took the clunky interface of Odesk and has imposed it on the new company. It’s amazing how the bigger the company gets, the farther from reality it gets. There doesn’t seem to be an end in sight. The people in charge seem to be oblivious of what’s happening to the UI. Every day without fail they have system outages. Neither clients or freelancers can access the system, their messaging system does not work. Their dispute resolution team behaves like third world monkey courts. Instead of trying to simplify, they are trying to make it more complicated and add even more features. As if all that was not enough, they raised their commission to 20%. A ton of clients have abandoned Upwork in total frustration and freelancers are following suit. Good news for competition. Chances of finding a good freelancer – Medium. Chances of finding a good team – Medium. Guru: This is the smallest of the bunch. Not a bad portal. They don’t have the wherewithal to promote themselves so they don’t have a large number of clients but they have a good number of freelancers. Worth looking into. Chances of finding a good freelancer – Fair. Chances of finding a good team – Poor. Whichever portal you go with, proceed carefully and in small steps. Try to establish good communications with the freelancer or team first, be it through Skype or telephone or email. Once you get comfortable with each other, outsourcing can be a great way of stretching your dollar.